Inspired by Shannon Messenger's month-by-month look back, I thought I'd do something similar. I like the idea of having this post to look back on when I'm having a bad day/week/month to remind myself I can be productive when I really put my mind to it. 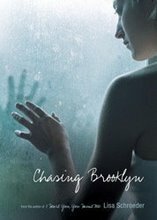 On January 5th, my third novel, Chasing Brooklyn was released. It received good reviews. Many readers told me it was their favorite book of mine yet. I breathed a big sigh of relief. On January 15th, I worked my last day at the day job so I could write full-time. I should have been on top of the world, but I received some rejections that I had to shake off, and it wasn't easy. But somehow, I did it, and the end of January saw me beginning a brand new story. On February 4th, I wrote this in a blog post about disappointment: "Believe it or not, I'm now thankful for that disappointment! Isn't that amazing? I'm actually THANKFUL for it! Because I am now writing a story that I love with my WHOLE, ENTIRE HEART." Middle grade fiction has always held a special place in my heart. 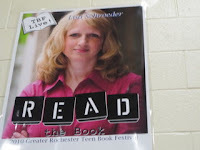 The first three novels I wrote (that were not good enough to be published) were middle grade. The strongest memories I have from my childhood around books and reading are during the middle grade years. Books were a lifeline for me then. So what a thrill to have my first middle grade book released to the world. And even more fun? Having a book release party with CUPCAKES!! In addition to the release, in the middle of March, I sent a new verse novel manuscript to my agent. She replied back, after reading it, "I LOVE this book." It's always a good month when a book sells. 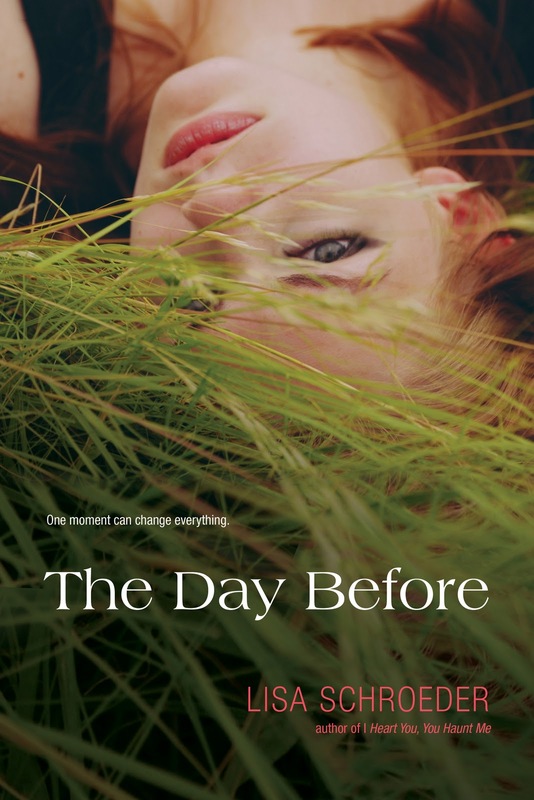 And the book I worked on night and day for two months, The Day Before, sold to Simon Pulse. And then I was off to San Antonio, for TLA, where I did a panel with Sonya Sones and Ellen Hopkins. Wow, I had SO much fun at that conference, and trust me when I say Texas Librarians are AWESOME! A highlight of that trip was chatting with Suzanne Collins (THE HUNGER GAMES) on the Skylink train in the Dallas airport. When I got home, I began working on a companion novel for It's Raining Cupcakes. The highlight of May was definitely the Rochester Teen Book Festival. 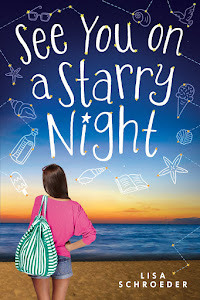 So fun meeting all kinds of amazing writers, including Joanne Levy who I sat by at dinner one night, and my on-line friends Deena and Kate from the Author2Author blog. And how many times does a person get a POSTER made of him/her? So cool. 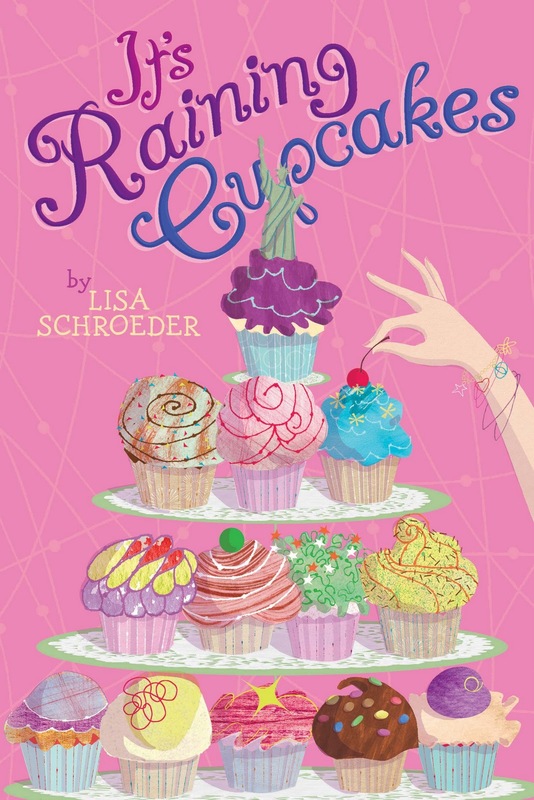 The end of May, I started writing a new MG novel, while we waited to hear back on the proposal and five chapters for the companion novel to It's Raining Cupcakes. I wrote fast and furious the first two weeks of June. I finished one middle grade novel and then decided, on a whim, to fast draft the rest of the companion novel to It's Raining Cupcakes. Yes, lots and lots of writing. And then revisions came for The Day Before and I spent long hours every day working on that. A vacation to Disneyland at the end of the month was a welcome break. And a signing at Vroman's, where I met Shannon Messenger, Alyson Beacher, Christine Henderson, and others I'm forgetting right now. Ack! LOTS of revising and a sale!! More revisions for The Day Before. And, hooray, Aladdin buys the companion novel to It's Raining Cupcakes, which stays untitled for the next few months. And of course, lots of summer fun. The SCBWI in LA is always a fun time and this was no exception. Lindsey and I scored a suite and we were the talk of the conference. Ah, good times. The first annual Write On Conference was a huge success and I was honored to be a part of it, with my video on writing romance in YA. AND, what an exciting time, launching the new group of contemporary authors called The Contemps. 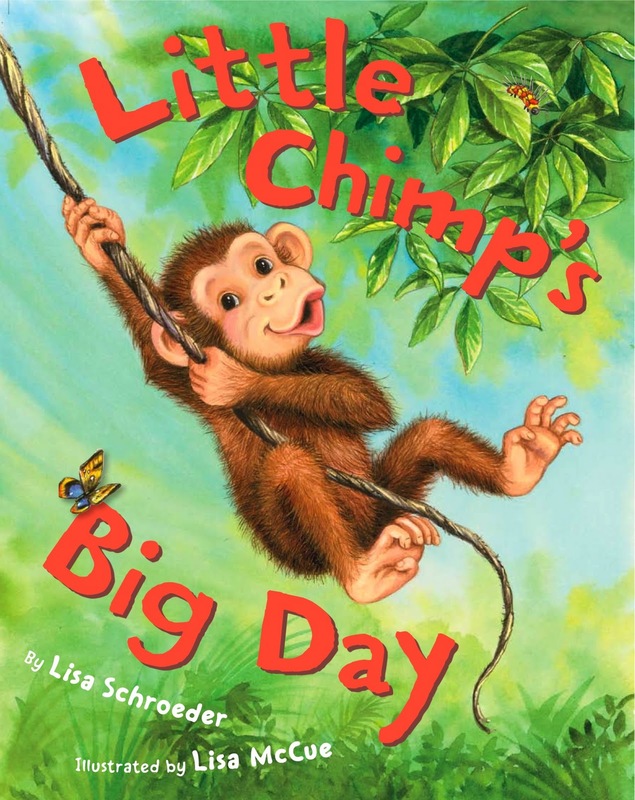 I sold Little Chimp's Big Day a long, long time ago. When it finally released, it was almost like - I wrote this? Yes, I did. 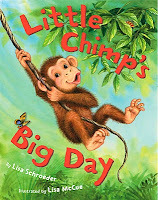 And Lisa McCue's illustrations are so adorable, and what fun to do a reading and signing with a group of little kids and share Little Chimp with them. And my friends Lisa and Sara too, who were so kind to drop by. I spent most of the month in revision mode. Again. For the companion novel to Cupcakes. We decide on the title Sprinkles and Secrets for the follow-up book to Cupcakes. Yay! I love it, it's perfect! And I start in on a new YA project. It is nice to be out of revision mode and back to writing something new. I moved my web site over to blogger to save money and to make it easier to update it myself. So far, I'm happy with that decision. I continued working on the YA novel, none of it very easy going this time. I just kept telling myself, keep writing, keep writing, keep writing. And, I got the cover for The Day Before. When I shared it with the world, the reaction was very, very positive. So excited to share Amber's story with the world in June!! I finished the year with a fourth manuscript complete. Yay! I will work on revising it in January and then, see what my agent thinks. 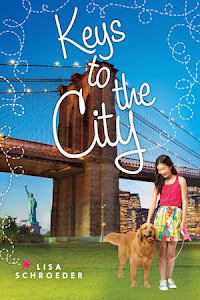 There's a middle grade novel up there in June that has been in a bit of limbo for a while, but I'm crossing my fingers for good things for that book (one really close to my heart) in 2011!! Wishing you all much success, as well as health and happiness, in the new year! What a terrific 2010! And what a treat to be able to work full time as a writer. I wish you even more success in 2011. Happy New Year! Thanks for the mention, Lisa. It was wonderful meeting and dining with you back in May. Congrats on a wonderful year and here's to many more ahead. Wishing you a happy, healthy and successful 2011! This a lovely recap! Absolute best of luck to you in 2011. May you be as productive and meet with even more success--however you choose to define it! This is very inspiring. Thanks for sharing! I hope 2011 is just as wonderful for you. Aw, thanks for the shout out Lisa--and wow, I feel like SUCH a slacker now. Clearly you need to teach me your "write a novel in an efficient amount of time skills" cause um...you wrote 4 books in the time it took me to revise one and write half of another. #Shannonfail. Can't wait to see what you can do with 2011. And I can't wait to meet Amber! Congrats on all the wonderful things you shared here. And I'm not surprised your successes because it's clear you love what you do, and you get a lot of writing done. Inspiring! I loved this list. So much happened in 2010! I'm wishing you a truly fantastic 2011, Lisa!